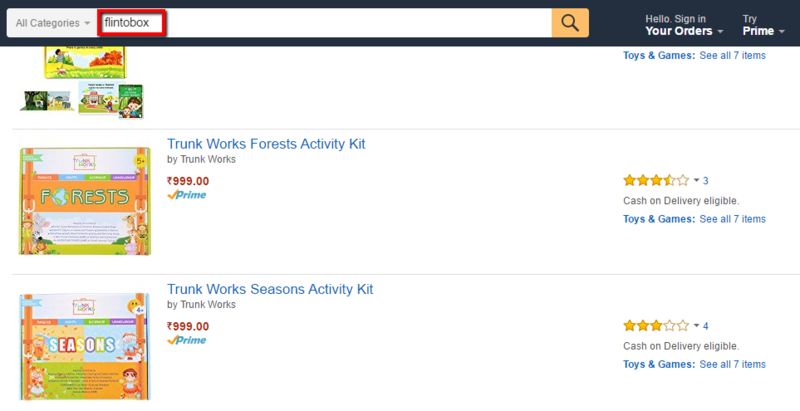 Want Amazon like Search experience in your online store? Signup now and see your visitor engagement improve or read from one of our data analysts on the inside workings of Amazon Search. Recently a fellow entrepreneur raised an issue on unfair acts by Amazon.in infringing on their trademark name “Flintobox”. The issue came alive because Amazon.in had bid for the keyword “Flintobox” on Google and given that it’s Amazon, there is no way a startup can outbid them. Also, legally no company is allowed to bid on a name that is trademarked by another entity. Below a screenshot of the dispute in question. This has been rectified by Amazon, but it sure caused some heartburn for the Flintobox founders, a few folks at Amazon and many small businesses that feel threatened by such incidents. It always confuses me when large, funded players are willing to outbid, underbid or even lose money to acquire your customer. This probably led to the founder sharing his woes across the social media where it was retweeted, shared and hence reached my timeline. My friends at Amazon, who speak highly of the company, insist that something like this must have been a mistake and not some personal agenda of any category manager to acquire customers by breaking the law. So, I personally spent some time trying to understand what could have happened, given that Amazon has been a very big influence in my life. 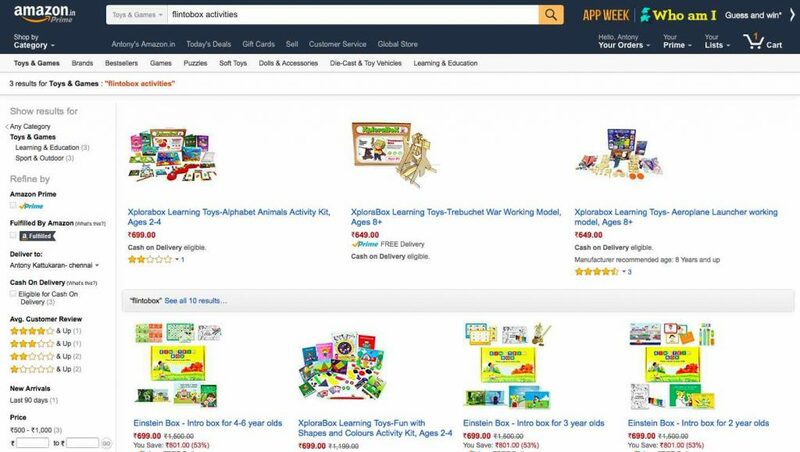 At Tagalys, one of the products we sell to our customers is personalized search as a service and we think the internal Amazon search tool, something that most visitors engage with, might be the cause to the above dispute. Here is our take on what could happened. We hope to hear your feedback as it will also help us improve what we live to build everyday. Today (Dec 21st, 2016, 1358 hours) if you visit amazon.in and search for “Flintobox” you will still find search suggestions, even though Amazon.in does not carry any stock of the Flintobox products. 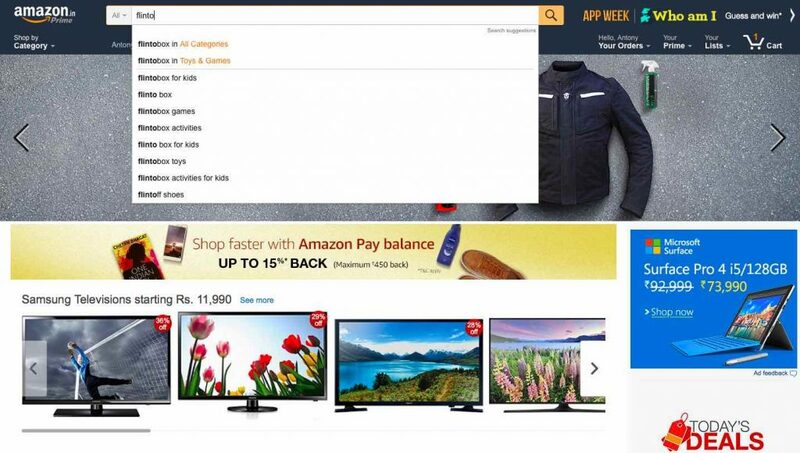 Now everyone knows “Search” at Amazon is best in class, hence there is no way Amazon will show you Flintobox in search suggestions, if the engine knows products are – OUT OF STOCK. But if you click on any of the suggestions, it leads to a Search results page, that as expected, does not display any Flintobox products instead it lists Einstein box or Xplora box. 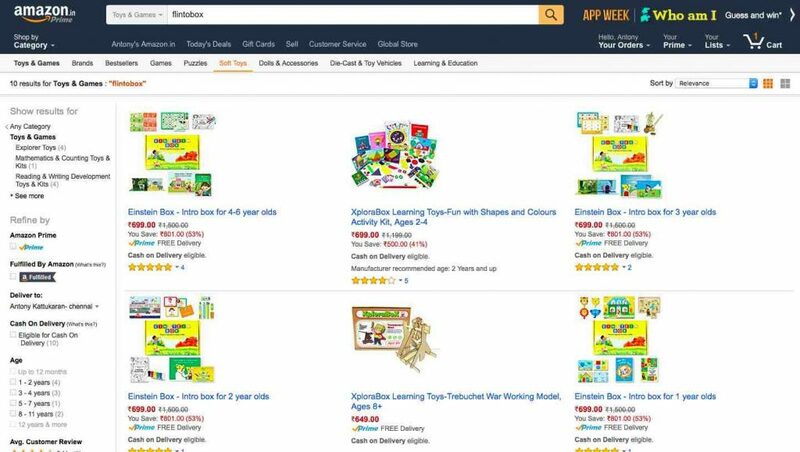 This leads to two possible reasons, when sellers upload products onto Amazon.in, they upload details about the products including tags, search keywords, potentially even synonyms. We assume, that these products had the “Flintobox” keyword somewhere in the seller upload sheet. Another reason, though highly unlikely, is that Amazon dynamically detects that products sold by FlintoBox, Einstein box, Xplora box are targeting the same customer segment. 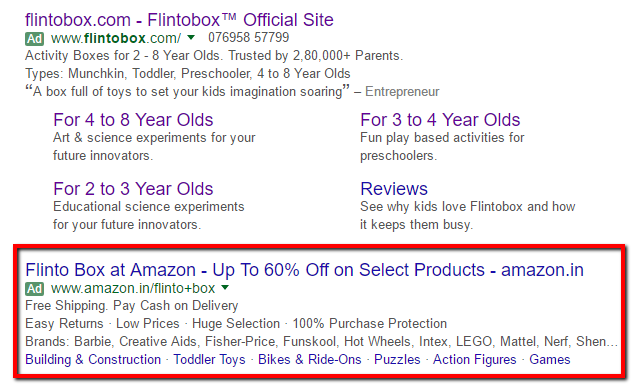 Hence even before a customer visits a “No results” page as Flintobox is not in stock, it redirects them to a page with products that will appeal to the same customer segment. Thereby ensuring engagement and potentially conversion. But what does all this have to do with an ad created for “Flintobox” by Amazon on Google? Every eCommerce Search or Site Search engine worth its salt, collects, groups and analyzes “Search” data and how visitors engage with the results across segments. Search is demand data directly from customers and visitors telling you what they want. There is also a high probability if X volume of visitors ask for something within your store, there are many more out there (Search engines like Google) who may want the same. So what could have been done to have avoided this incident? If the above assumptions are correct, then the Amazon seller services team should have more checks in place when sellers upload data. Google today will not allow you to bid for a search keyword that is trademarked by another entity and something similar within Amazon Seller services could have voided this incident from happening. Another way, although rudimentary is the compare the seller upload tags/keywords data with the Brand names stored within the Amazon database. This may not cover trademark infringements, but will definitely avoid Brand X showing in suggestions of results when Brand Y is what a visitor is searching for. I feel this was not done on purpose, but sometimes a small mistake by a large company is enough to make a big impact in the ecosystem around them. While an apology may have been issued, it does not help with the loss in cash flow that many of the smaller companies rely to grow. Fortunately Flintobox survived to tell a story, many others may not. SIGNUP NOW, join a free plan or a free trial to know whats best for you. © 2018 Tagalys LLC. All rights reserved.